The French Riviera is one of the most popular places to charter a yacht in the Med, with its quaint villages and stunning bays, you can enjoy a varied trip from Monaco to St Tropez! Travelling along the coast, you will find yourself in a new surrounding each day and what better way to mix up your charter by spending a long lazy lunch in one of the best beach restaurants along the coast. Hire a yacht for the day from Cannes, St Tropez or any of our French Riviera destinations to access the beach clubs in true style. Eden Plage Mala – located just before Cap d’Ail on the way towards Monaco. Accessible only by boat or two mysterious winding paths it’s the perfect retreat if you’re looking to escape the crowds. Stunning booths under beautiful wooden canopies provide shade and giving a sense of seclusion, whilst the bright colours around give the whole club an energised feel. Fresh fish and lobster every day, combined with the option of either a Swedish or Japanese massage you’ll leave feeling like a new person! Live bands on the weekends mean Eden Plage Mala even offers something for the party-minded. Paloma Beach. 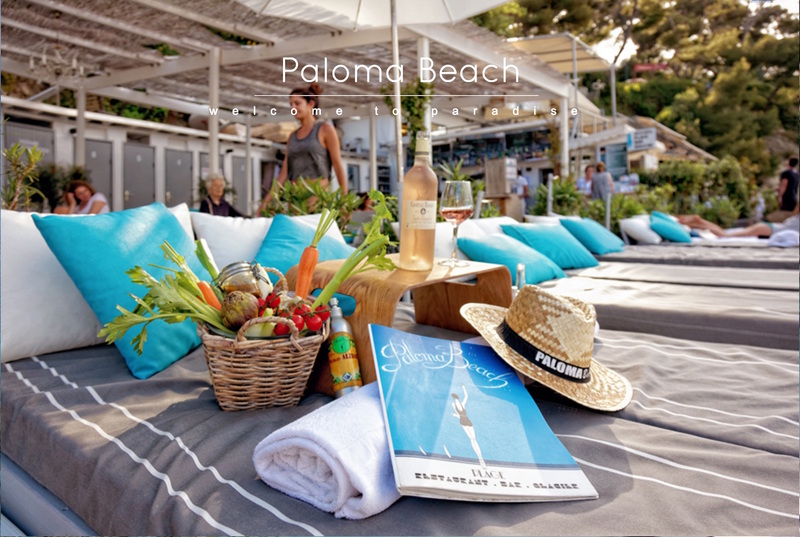 A favourite of the Boatbookings team, Paloma Beach is situated in the beautiful bay of Saint-Jean-Cap-Ferrat. The dramatic cliff faces create a secluded place to enjoy a relaxing extended lunch and enjoy the crystal clear waters. Simplicity and authenticity is the key here, with fish being the centre of attention, whether it be a whole catch of the day to share or beautifully contemporary seafood dishes there’s something on this menu for every taste. 3. La Guerite. One of our absolute favourite restaurants which we recently visited on Ile Marguerite, just off Cannes. La Guérite offers a beautiful setting where politics, stress and troubles are left behind! La Guerite offers marvellous views of Cannes in a peaceful location on an island where the noise of modern transport is a distant memory. The glorious light underneath the seaweed inspired canopy will put you in a calm and serene spirit whilst you dine on some of the best food on the coast. 4. 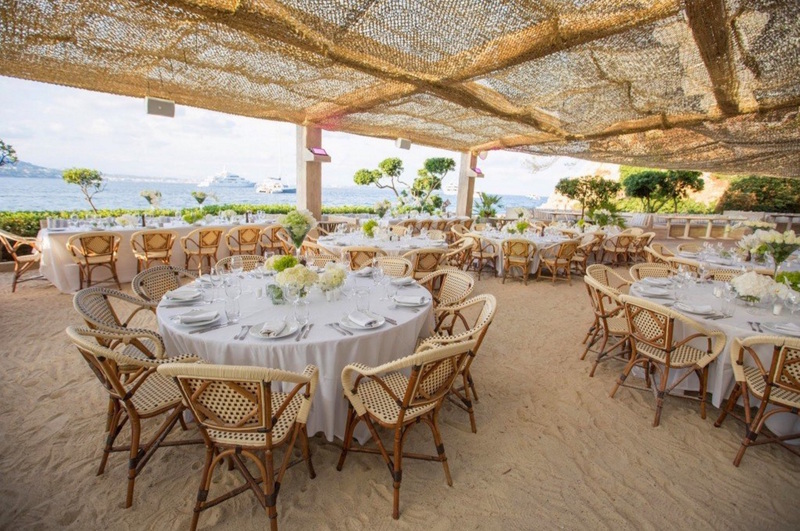 Club 55 is an institution in St Tropez; founded in 1955 by a film crew – hence the name, her white sands were once frequented by Brigitte Bardot. Today hundreds of yachties flock here every summer to enjoy wonderful Mediterranean seafood, market fresh platters and long sunny afternoons at this legendary beach club. 5. Nikki Beach opened in 2002, and since then has become one of the main attractions for the rich and famous. This popular beach club offers chilled champagne, superb cuisine including delicious salads, creative sushi rolls and original seafood entrees accompanied by chilled champagne! With fantastic DJs, exciting events and amazing fashion shows to keep you entertained, there really is no other place like it. Contact Boatbookings now to book your beach club tour of the French Riviera this summer! If you’d like to see a more extensive list of restuarants along the Riviera, see our Top Restaurants Page. You are spoilt for choice with places to visit in the impressive Principality of Monaco including opulent casinos, fragrant gardens and the Prince’s Palace (Palais Princier) along with the world famous Grand Prix circuit, all leading back to the popular port Hercule where some of the world’s finest yachts can be found. So, rent a yacht in Monaco for an all round unrivalled experienced of this lavish location.